How to Hide the Complete Excel 2013 Workbook? This article will explain in simple steps on how to hide the complete workbook in Microsoft Excel 2013. The Microsoft Excel 2013 offers different options for the user to hide not only the UI elements but also the complete spreadsheet or workbook. This is an interesting feature which hides the complete workbook and thus preventing the users to see or make changes to the excel sheet. This feature does not hide the workbook permanently. If you want to show the workbook again, you can utilize the unhide feature. 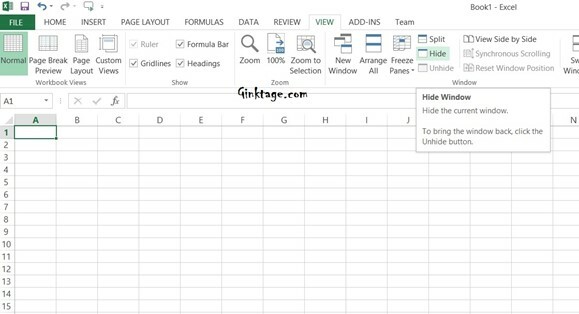 To Hide the Excel 2013 workbook, navigate to the View tab in the Microsoft Office 2013 and in the “Window Group”, click the Hide button. This will immediately all the worksheets in the current workbook. 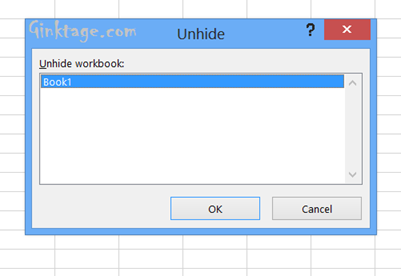 To display the workbook again, click the unhide button. This will display a dialog where you can select the workbook sheets that was already hidden. Select one of them to display.